The Basil California is a bicycle basket that’s perfect for those in need of a storage solution for work or school. The Basil California is incredibly practical and designed with everyday storage in mind. Made from a fine-grained steel, this unisex bicycle basket comes in classic black for an effortless complement to all manner of bikes. This modern basket is designed for fixed mounting at the rear of your bike via the luggage carrier, with plenty of internal storage space for all those essential items. Stow your backpack and textbooks if you’re heading into school, or use it to place your office essentials and packed lunch if you’re heading out for a day at work. This basket is particularly useful for those who wear a satchel, providing enough space to store one while you cycle. Perfect if you usually wear one and don’t want to cause any balancing problems when you ride. 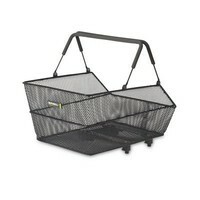 This sturdy basket is designed for carrying heavier loads, making it equally useful for visits to the store or gym. 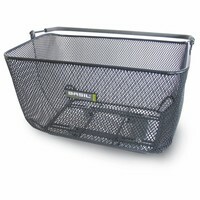 Easily attached to your frame with the BASCO clamp system, this basket fits lengthwise against your carrier. This clamp system is suitable for frames with carriers having a maximum diameter of 1.2 cm. The main basket is also removable, with two convenient handles meaning you can free it from your frame and take it with you once the ride is over. A handy addition for those cycling to the store to pick up a shopping list, or those cycling to work who don’t want the worry of their bike or accessories being lifted by thieves. Easily fitted with the BASCO clamp system. Fits against the length of your luggage carrier. This hardy basket prevents overloading of your back and shoulders. Easily removable and carried with two convenient handles.